A yellow golden bracelet of the brand Marco Bicego, model Africa Ruby - bb2251-L-ru01, set with rubies. A yellow golden bracelet of the brand Marco Bicego, model Africa Emerald - bb2251-L-sm01, set with emerald. A yellow golden bracelet of the brand Marco Bicego, model Africa Sapphire - bb2251-L-zb01, set with sapphires. A yellow golden necklace of the brand Marco Bicego, model Africa Ruby - cb2323-ru01, set with 6 rubies. A yellow golden necklace of the brand Marco Bicego, model Africa Emerald - cb2323-sm02, set with 6 emerald. 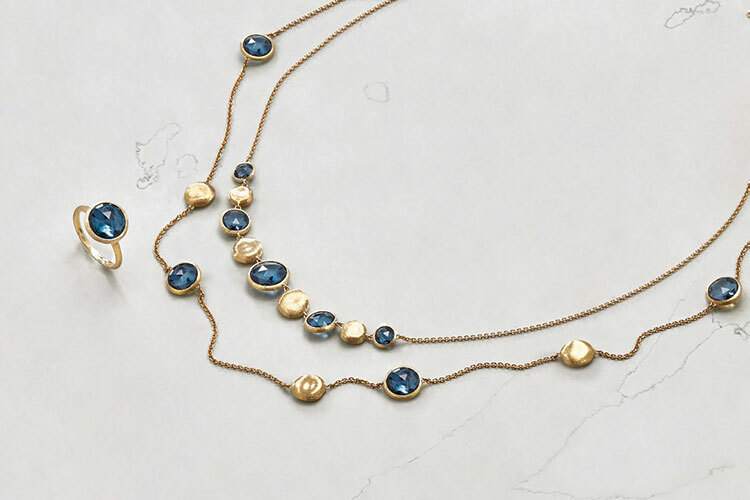 A yellow golden necklace of the brand Marco Bicego, model Africa Sapphire - cb2323-zb02, set with 6 sapphires. A yellow golden earring of the brand Marco Bicego, model Africa Ruby - ob1581-ru01, set with 6 rubies. A yellow golden earring of the brand Marco Bicego, model Africa Emerald - ob1581-sm02, set with 6 emerald. A yellow golden earring of the brand Marco Bicego, model Africa Sapphire - ob1581-zb02, set with 6 sapphires. A yellow golden earring of the brand Marco Bicego, model Africa Ruby - ob1596-ru01, set with 2 rubies. A yellow golden earring of the brand Marco Bicego, model Africa Emerald - ob1596-sm01, set with 2 emerald. A yellow golden earring of the brand Marco Bicego, model Africa Sapphire - ob1596-zb01, set with 2 sapphires. A yellow golden ring of the brand Marco Bicego, model Lunaria - ab551. A yellow golden earring of the brand Marco Bicego, model Paradise - ob1430-mix01, set with a mix of color stones. A yellow golden earring of the brand Marco Bicego, model Lunaria - ob1348. A yellow golden ring of the brand Marco Bicego, model Lunaria - ab550. Een geelgouden oorsieraad van het merk Marco Bicego, model Africa - OB1157. A yellow golden earring of the brand Marco Bicego, model Africa - ob1468. A yellow golden earring of the brand Marco Bicego, model Lunari - ob1343-A. A yellow golden earring of the brand Marco Bicego, model Lunari - ob1343-AB MPW, set with 6 brilliant cut diamonds with a total weight of approx. 0,05 crt. en pearls. A yellow golden earring of the brand Marco Bicego, model Lunari - ob1403 MPW, set with pearls. A yellow golden ring of the brand Marco Bicego, model Marrakech Supreme - ag328. A yellow golden necklace of the brand Marco Bicego, model Paradise - cb1905-mix01, set with a mix of color stones. A yellow golden bracelet of the brand Marco Bicego, model Paradise - bb1865-mix01, set with a mix of color stones. A yellow golden earring of the brand Marco Bicego, model Jaipur - ob957-tpl01, set with 2 . A yellow golden ring of the brand Marco Bicego, model Jaipur - ab471-tpl01, set with 1 . A yellow golden ring of the brand Marco Bicego, model Lunaria - ab564-aqd, set with 1 aquamarine gemstone. A yellow golden necklace of the brand Marco Bicego, model Delicati - cb1810. 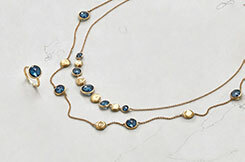 A yellow golden necklace of the brand Marco Bicego, model Lunaria - cb1877-lp, set with 1 Lapis. A yellow golden necklace of the brand Marco Bicego, model Murano Link - cb1825-b, set with brilliant cut diamonds with a total weight of approx. 0,11 crt. A yellow golden necklace of the brand Marco Bicego, model Lunaria - cb1777. 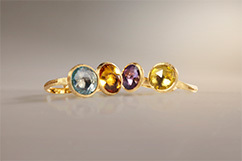 A yellow golden ring of the brand Marco Bicego, model Murano - ab553-tv01, set with 1 tourmaline gemstone. A white golden ring of the brand Marco Bicego, model Goa - ag322-b, set with brilliant cut diamonds with a total weight of approx. 0,13 crt. A yellow golden earring of the brand Marco Bicego, model Jaipur - ob1423-qg01, set with 2 citrine gemstones. A yellow golden bracelet of the brand Marco Bicego, model Lunaria - bb1914-lp, set with 3 Lapis gemstones. A yellow golden ring of the brand Marco Bicego, model Lunaria - ab565-aqd, set with 1 aquamarine gemstone. A yellow golden ring of the brand Marco Bicego, model Jaipur - ab586-tp01, set with 1 topaz gemstone. A yellow golden bracelet of the brand Marco Bicego, model Marrakech Supreme - bg750. A yellow golden bracelet of the brand Marco Bicego, model Jaipur - bb1485-tpl01, set with 6 . A yellow golden necklace of the brand Marco Bicego, model Jaipur - cb1243-tpl01, set with 5 . A yellow golden earring of the brand Marco Bicego, model Lunaria - ob1428-aqd, set with 2 aquamarine gemstones. A yellow golden earring of the brand Marco Bicego, model Jaipur - ob901-tpl01, set with 8 . A yellow golden earring of the brand Marco Bicego, model Marrakech Supreme - og343. A yellow golden necklace of the brand Marco Bicego, model Lunaria - cb1982-aqd, set with 5 aquamarine gemstones. A yellow golden ring of the brand Marco Bicego, model Jaipur - ab586-at01, set with 1 amethyst gemstone. A yellow golden earring of the brand Marco Bicego, model Master Pieces - ob1349-tm02, set with tourmaline gemstones. Een geelgouden oorsieraad van het merk Marco Bicego, model Jaipur - ob855-mpw, bezet met parelmoer. A yellow golden earring of the brand Marco Bicego, model Paradise Aquamarine - ob1430-aq01, set with 4 aquamarine gemstones. A yellow golden earring of the brand Marco Bicego, model Paradise Aquamarine - ob1431-aq01, set with aquamarine gemstones. A yellow golden necklace of the brand Marco Bicego, model Marrakech Supreme - cg750. A yellow golden earring of the brand Marco Bicego, model Murano Link - ob1313-p-b, set with brilliant cut diamonds with a total weight of approx. 0,33 crt. A white golden ring of the brand Marco Bicego, model Goa - ag323-b, set with brilliant cut diamonds with a total weight of approx. 0,26 crt. A yellow golden necklace of the brand Marco Bicego, model Master Pieces - cb2125-tm01, set with tourmaline gemstones. A yellow golden earring of the brand Marco Bicego, model Lunaria Master Pieces - ob1349-za01, set with 2 orange sapphires. A yellow golden bracelet of the brand Marco Bicego, model Jaipur - bb2194-tpl01, set with 8 . A yellow golden necklace of the brand Marco Bicego, model Delicati - cb1806-b-tp01, set with brilliant cut diamonds with a total weight of approx. 0,02 crt. en 1 topaz gemstone. A yellow golden necklace of the brand Marco Bicego, model Lunaria - cb1790. A yellow golden necklace of the brand Marco Bicego, model Delicati - cb1800-at01, set with 1 amethyst gemstone. A yellow golden earring of the brand Marco Bicego, model Marrakech - og207-b1, set with brilliant cut diamonds with a total weight of approx. 0,40 crt. A yellow golden necklace of the brand Marco Bicego, model Delicati - cb1797. Een geelgouden ring van het merk Marco Bicego, model Jaipur - ab451-mpw, bezet met witte parelmoer. A white golden ring of the brand Marco Bicego, model Goa - ag270-b2, set with brilliant cut diamonds with a total weight of approx. 0,25 crt. A yellow golden bracelet of the brand Marco Bicego, model Lunaria Master Pieces - bb2211-mixz, set with a mix of color stones. Een geelgouden ring van het merk Marco Bicego, model Murano - ab506-mix89, bezet met 1 amethist edelsteen en 1 rhodoliet edelsteen. A yellow golden bracelet of the brand Marco Bicego, model Lunaria - bb1914-aqd, set with 3 aquamarine gemstones. 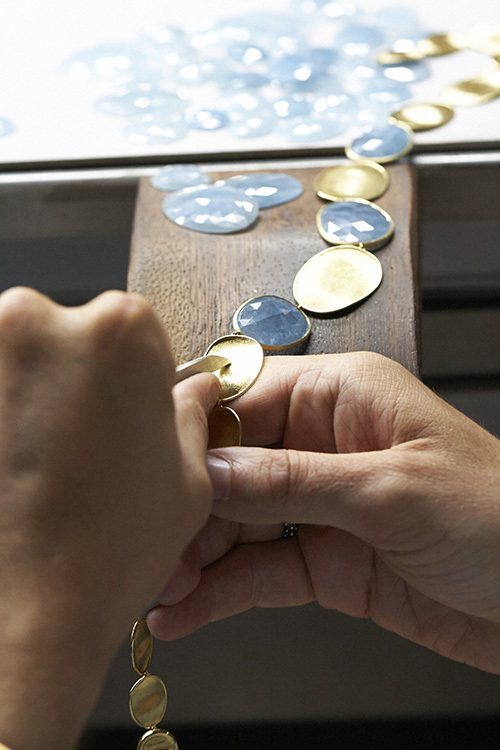 A yellow golden ring of the brand Marco Bicego, model Lunaria - ab565-lp, set with Lapis gemstones. A yellow golden bracelet of the brand Marco Bicego, model Jaipur - bb1988-mix01, set with a mix of color stones. Een 5 rijen brede geelgouden armband van het merk Marco Bicego, model Jaipur - bb1307-mix01, bezet met een mix van kleurstenen. A yellow golden necklace of the brand Marco Bicego, model Delicati - cb1806-b-al01, set with brilliant cut diamonds with a total weight of approx. 0,02 crt. en 1 amethyst gemstone. A yellow golden bracelet of the brand Marco Bicego, model Lunaria - bb1777. A yellow golden necklace of the brand Marco Bicego, model Delicati - cb1811-b, set with brilliant cut diamonds with a total weight of approx. 0,09 crt. A yellow golden earring of the brand Marco Bicego, model Jaipur - ob900-A-mix07, set with 2 citrine gemstones en 2 amethyst gemstones. A yellow golden necklace of the brand Marco Bicego, model Jaipur - cb1987-mix01, set with a mix of color stones. A yellow golden necklace of the brand Marco Bicego, model Lunaria - cb1878-aqd, set with 3 aquamarine gemstones. A yellow golden earring of the brand Marco Bicego, model Jaipur - ob900-A-mix112, set with 2 topaz gemstones en 2 citrine gemstones. A yellow golden necklace of the brand Marco Bicego, model Lunaria Diamond - cb1974-b, set with brilliant cut diamonds with a total weight of approx. 0,53 crt. A yellow golden bracelet of the brand Marco Bicego, model Delicati - bb1811. Een geelgouden collier van het merk Marco Bicego, model Jaipur - cb1238-mix01, 92cm lang, bezet met mix van kleurstenen. A yellow golden ring of the brand Marco Bicego, model Jaipur - ab450-qg01, set with 1 yellow quartz gemstone. A yellow golden earring of the brand Marco Bicego, model Lunaria Unique Piece - ob1538-bb0tm02, set with 6 briolette cut diamonds with a total weight of approx. 1,26 crt. en 2 tourmaline gemstones. A yellow golden earring of the brand Marco Bicego, model Africa - ob921. 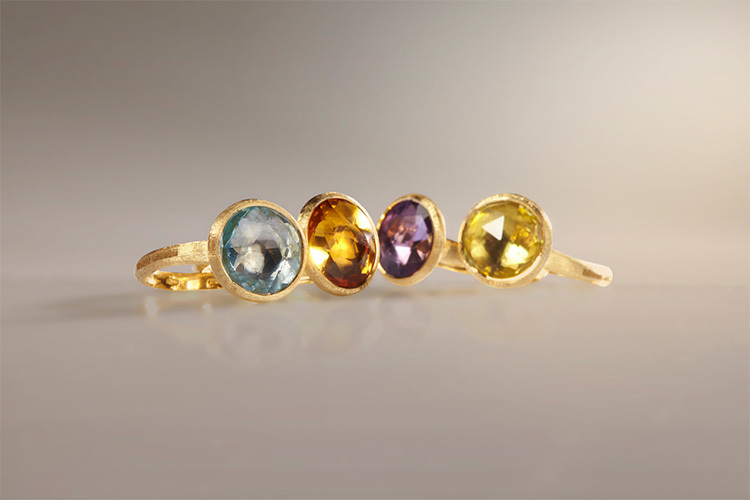 A yellow golden earring of the brand Marco Bicego, model Master Pieces - ob1349-tv01, set with tourmaline gemstones. A yellow golden necklace of the brand Marco Bicego, model Master Pieces - cb2110-tm01, set with tourmaline gemstones. A yellow golden earring of the brand Marco Bicego, model Lunaria Unique Piece - ob1538-bb0tm01, set with briolette cut diamonds with a total weight of approx. 1,26 crt. en 2 tourmaline gemstones. A yellow golden earring of the brand Marco Bicego, model Jaipur - ob900-mix07, set with 2 citrine gemstones en 2 amethyst gemstones. A yellow golden necklace of the brand Marco Bicego, model Delicati - cb1800-qg01, set with 1 citrine gemstone. A yellow golden bracelet of the brand Marco Bicego, model Jaipur - bb1987-mix01, set with a mix of color stones. A yellow golden ring of the brand Marco Bicego, model Lunaria Diamond - ab550-b, set with brilliant cut diamonds with a total weight of approx. 0,14 crt. A yellow golden ring of the brand Marco Bicego, model Murano - ab553-at01, set with 1 amethyst gemstone. A yellow golden necklace of the brand Marco Bicego, model Marrakech - cg338-b5, set with brilliant cut diamonds with a total weight of approx. 1,15 crt. A yellow golden ring of the brand Marco Bicego, model Marrakech - ag158-b6, set with brilliant cut diamonds with a total weight of approx. 0,35 crt. A yellow golden ring of the brand Marco Bicego, model Marrakech - ag157-b7, set with brilliant cut diamonds with a total weight of approx. 0,45 crt. Een geelgouden hanger van het merk Marco Bicego, model Jaipur - CB1363-mix50, bezet met 1 topaas edelsteen. Een geelgouden armband van het merk Marco Bicego, model Marrakech - bg337. A yellow golden necklace of the brand Marco Bicego, model Jaipur - cb2254-tpl01, set with 5 . Een geelgouden oorsieraad van het merk Marco Bicego, model Murano Link - ob1267-mix07, bezet met 2 yellowquartz edelstenen en 2 amethist edelstenen. A yellow golden earring of the brand Marco Bicego, model Lunaria Master Pieces - ob1345-aga02, set with 2 aqate gemstones. A yellow golden necklace of the brand Marco Bicego, model Jaipur - cb1239-mix01, set with a mix of color stones. A yellow golden ring of the brand Marco Bicego, model Marrakech Supreme - ag327. A yellow golden necklace of the brand Marco Bicego, model Delicati - cb1811. A yellow golden ring of the brand Marco Bicego, model Lunaria Diamond - ab551-b, set with brilliant cut diamonds with a total weight of approx. 0,14 crt. A yellow golden earring of the brand Marco Bicego, model Lunaria Unique Piece - ob1538-bb01, set with 6 briolette cut diamonds with a total weight of approx. 1,26 crt. 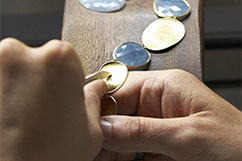 A yellow golden pendant of the brand Marco Bicego, model Lunaria - cb1768. A yellow golden earring of the brand Marco Bicego, model Marrakech Supreme - og342. A yellow golden ring of the brand Marco Bicego, model Jaipur - ab586-tpl01, set with 1 . A yellow golden necklace of the brand Marco Bicego, model Delicati - cb1809. A yellow golden ring of the brand Marco Bicego, model Murano - ab553-tr01, set with 1 tourmaline gemstone. A yellow golden necklace of the brand Marco Bicego, model Murano Link - cb1826-b, set with brilliant cut diamonds with a total weight of approx. 0,17 crt. A white golden earring of the brand Marco Bicego, model Goa - og308-A-b2, set with brilliant cut diamonds with a total weight of approx. 0,47 crt. A yellow golden earring of the brand Marco Bicego, model Jaipur - ob1576-tpl01, set with 2 . A yellow golden necklace of the brand Marco Bicego, model Lunaria - cb1898-aqd, set with 1 aquamarine gemstone. A yellow golden necklace of the brand Marco Bicego, model Jaipur - cb1485-tpl01, set with 7 . A yellow golden ring of the brand Marco Bicego, model Jaipur - ab586-qg01, set with 1 citrine gemstone. A yellow golden earring of the brand Marco Bicego, model Lunaria - ob1403-aqd, set with 2 aquamarine gemstones. A yellow golden earring of the brand Marco Bicego, model Jaipur - ob900-A-mix52, set with 2 topaz gemstones en 2 amethyst gemstones. Een geelgouden oorsieraad van het merk Marco Bicego, model Murano - ob1135-qg01, bezet met 2 yellowquartz edelstenen. Een witgouden armband van het merk Marco Bicego, model Marrakech - bg337. A white golden ring of the brand Marco Bicego, model Goa - ag322-b2, set with brilliant cut diamonds with a total weight of approx. 0,26 crt. A yellow golden bracelet of the brand Marco Bicego, model Paradise - bb1906-mix01, set with a mix of color stones. A yellow golden earring of the brand Marco Bicego, model Marrakech Supreme - og341. A yellow golden earring of the brand Marco Bicego, model Jaipur - ob1470-tp01, set with 2 topaz gemstones. A yellow golden earring of the brand Marco Bicego, model Lunaria Master Pieces - ob1348-qg02, set with 2 citrine gemstones. A yellow golden pendant of the brand Marco Bicego, model Pianeti - cb1177b-tr01, set with brilliant cut diamonds with a total weight of approx. 0,23 crt. en 1 tourmaline gemstone. A yellow golden earring of the brand Marco Bicego, model Paradise - ob1431-mix01, set with a mix of color stones. A yellow golden bracelet of the brand Marco Bicego, model Paradise Aquamarine - BB1865-AQ01, set with aquamarine gemstones. Een geelgouden armband van het merk Marco Bicego, model Jaipur - sb34-mix01, bezet met 1 tourmalijn edelsteen, 1 citrien edelsteen en 1 amethist edelsteen. A yellow golden earring of the brand Marco Bicego, model Jaipur - ob1082-o-tpl01, set with 2 . Een geelgouden oorsieraad van het merk Marco Bicego, model Murano - ob1131-mix52, bezet met 2 amethist edelstenen en 2 topaas edelstenen.